Hewlett-Packard, also known as HP, is a household name in the computer and consumer electronics world. They make everything from computers to printers and also offer other brands through their shopping portal. 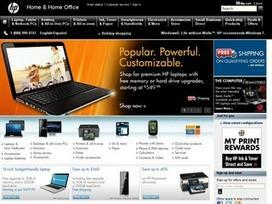 The HP shopping site expands well beyond what a customer might assume HP has to offer. While their computers, printers and other products take up a great deal of the shopping real estate, other products and brands can be found there as well. The HP computers are divided between desktop, laptop and Netbook computer categories. The desktop computers are prebuilt systems that cover a wide range of needs from basic computing up to high performance gaming. The laptops also have the same type of category spread, with a budget range that accommodates many different people. The Netbook computers are low-cost laptops that do not have the same computing powering as the other systems, but they do offer a very affordable option for people who do not need a great deal of computing power. The printers suit many different needs, whether a photo printer or an all-in-one model is needed. These printers are one of HP's most well known products. Customers can also purchase printer ink and other accessories for the printers in this section. The electronics section contains many other brands that HP offers. The televisions, cameras, calculators, photo frames, and more encompass a wide variety of product offerings. While customers can find these particular products elsewhere, the convenience of having it all on one site is quite handy. HP also provides a section for businesses, with computers and related products that are suited toward business needs more than consumer level demand. These computers and peripherals are made to stand up to constant, mission critical use. This section is a good starting point for any company that needs to figure out what it needs for its information technology requirements. The accessories category contains products that provide an added value to the computers that HP offers. These products range from routers to additional storage. While customers don't need any of these accessories to use their HP products, many are helpful in certain situations. HP is a household name for a reason. Their computers are built well and their technical support provides help with any problems that customers have. The shopping portal provides any product that the customer needs to get on their feet with a computer or other form of consumer electronic. The stock changes frequently, and HP provides coupon codes at many different times. When a customer is looking for a computer, he can compare many different types of products to find the system that exactly suits his needs. These computers are built to last and perform in many different situations, with a flexibility that provides plenty of value. The HP shopping portal knows what its customers are looking for, and how to deliver on that with service and selection. Share what you think about HP, and your favorite ways to save there!